Gunther Schuller: A Little Jazz, A Little Classical, Too Little Sleep Nobody could accuse composer Gunther Schuller of slacking off. He played principal French horn in the Cincinnati Symphony as a teenager, collaborated with Miles Davis and developed a new classical-jazz hybrid. And at 83, he's still composing. More information about Gunther Schuller's albums is available at his record label, GM Recordings. Gunther Schuller doesn't sleep much. "When I was 18, my parents tell me you have to sleep eight hours every night," he says. "And I said, 'God, you know, if I sleep eight hours every night, I'm going to piss away one-third of my life just by sleeping.' And life is too short. " 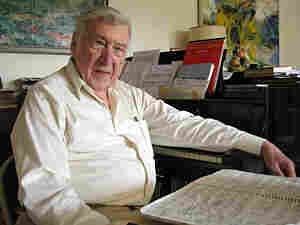 In his waking hours, Schuller has composed nearly 200 pieces of music over the past seven decades. Schuller's latest, called "Where The Word Ends," was recently premiered by the Boston Symphony Orchestra. Jazz writer Bob Blumenthal was in the audience. He calls the work a "time capsule" of Schuller's career. "I was sitting there, and at one point I said, 'Oh boy, yea, he sure loves Stravinsky' — just some of the rhythmic tension which isn't a jazz rhythmic tension," Blumenthal says. "There are other parts where I said, 'Oh yes, he did play with the Miles Davis nonet' ... And Gunther as a kid was playing in that band, so I really felt like I was hearing a lot of Gunther in there." Schuller is well known for straddling both classical and jazz. His father was a violinist in the New York Philharmonic, and as a teenager, he inhaled music by Stravinsky, Beethoven, Ravel and Schoenberg. "I was so possessed by music, so obsessed with it, that I just worked every day studying, I would say 18, 19 hours," Schuller says. "Sometimes I didn't even eat." Certainly, no one would accuse him of slacking off. At the age of 83, Schuller has a Pulitzer Prize under his belt, and a MacArthur Foundation "Genius Grant." In his childhood, Schuller longed to be a composer, but he was a natural on the French horn. At the age of 16, he landed his first job, with the Cincinnati Symphony Orchestra. He later returned to New York to join the Metropolitan Opera Orchestra. One night, sitting in the kitchen doing schoolwork, Schuller says he heard something on the radio that completely rocked his world. "I said to my father, 'You know, Pop, I heard some music — Duke Ellington — last night, and that music is as great as Beethoven's and Mozart's,' " he says. "And he almost had a heart attack because that was a heretical thing to say." Jazz became Schuller's new obsession. In the late '40s and early '50s, French horn players were rare in jazz ensembles, and that helped him get in with some greats — including Miles Davis. The trumpeter invited Schuller to record on the sessions that became the classic album The Birth of the Cool. Schuller got his big break on the concert stage in 1956. That's when the music director of the New York Philharmonic conducted and broadcast Schuller's "Music for Brass." "The next thing I know, I get a letter from Aaron Copland, and from Samuel Barber, and all these famous composers who were, you know, the kings of the land," Schuller says. "And suddenly I was a recognized composer of at least some promise, and perhaps of some importance." "So I was living this double life, jazz and classical music, and how much more wonderful can it be?" Schuller asked. Well, actually, Schuller thought it could be more wonderful, so he created a third life by combining jazz and classical. He dubbed it "The Third Stream." Schuller may have been happy, but bringing the jazz club into the concert hall, and vice versa, didn't please everyone. "It wasn't controversial to me — it was totally logical," he says. "In fact, I said, 'My God, these two great musics and they are in separate camps — they don't talk to each other, they hate each other, they vilify each other. We've got to get these musics together.' "
To that end, Schuller enlisted the help of a young, improvisation-oriented pianist named Ran Blake. Blake went to the New York jazz clubs with Schuller and became his student. He says Schuller was the first to say his Third Stream concept wasn't actually new. "Porgy and Bess could be considered Third Stream," Blake says. "Beethoven using country dances, yes, that's mixing court with the field music — it's not quite as dramatic as jazz, classical, Ethiopian, Richard Strauss." Blake and Schuller moved to Boston, where Schuller became the president of the New England Conservatory in 1967. There they created the Third Stream Department. And Schuller continued to make trouble. Always outspoken, he wrote highly critical books about jazz and classical music. He also conducted, and started his own record label. But composing has remained Schuller's life force. The New England Philharmonic recently performed a piece he composed at age 19. Schuller was thrilled to hear it performed for only the second time. Standing in his living room, surrounded by books and stacks of orchestral scores he writes by hand, Schuller says the creative process that has consumed him since he wrote his first piece — on a toy xylophone for his baby brother — still mystifies him. "Why are we sitting there with a blank piece of paper and an idea comes to us, suddenly — where does it come from, you know?" he says. "We don't know. We will never know." What Schuller does know for sure is that there is little time for sleep. There are deadlines to meet: He has five orchestra compositions to finish this year.